Mindi, Courtney and I made these for all the Dad's at church. Popcorn boxes filled with yummy popcorn. Popcorn #1 Chocolate peanut butter. Found this on Our Best Bites. 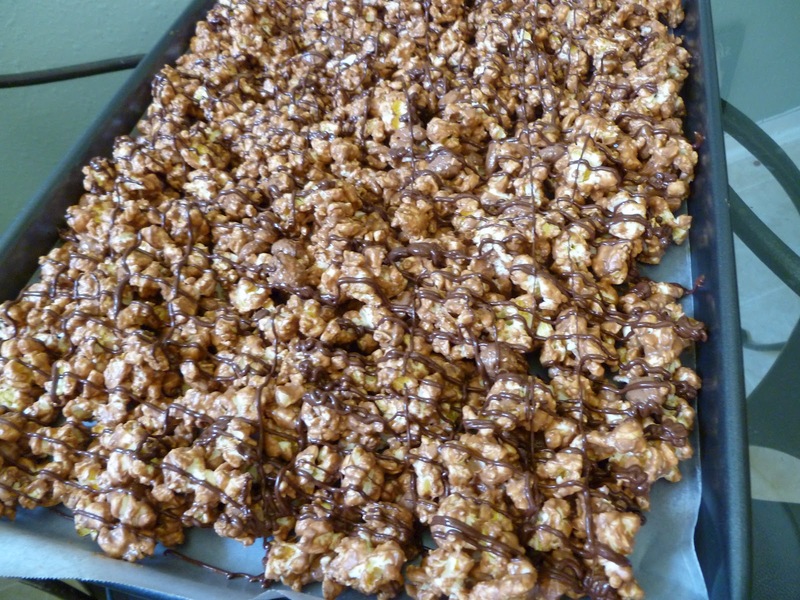 * If you want more chocolatey flavor in your popcorn, substitute 1 c. of the peanut butter chips with 1 c. of chocolate chips and then still drizzle the chocolate over the popcorn at the end. Place the peanuts, popped popcorn in a very large bowl. In a microwave-safe bowl, combine the peanut butter chips and vegetable oil or shortening and heat for 2-2 1/2 minutes or until smooth, stirring every 30 seconds. 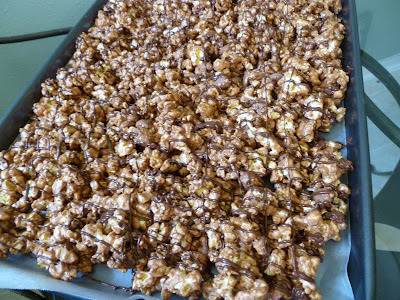 Drizzle the melted peanut butter chips over the popcorn and peanuts and toss to combine. Spread the popcorn onto a wax paper-lined baking sheet. In a Ziploc bag, heat the semi-sweet chocolate chips until just melted and smooth (about 1-1 1/2 minutes, mashing the bag every 20-30 seconds). Cut a small corner in the Ziploc bag and drizzle the chocolate over the popcorn. Allow to stand long enough to become solid (you can transfer the pan to the fridge or freezer to hurry this step along). 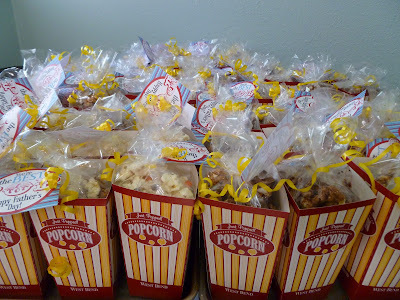 When done, break the popcorn into small pieces and enjoy! Popcorn #2 White chocolate cake. Found this on Pinterest. Put popped popcorn in large bowl. Melt almond bark with crisco in a microwavable bowl then add the cake mix. It will get really thick. 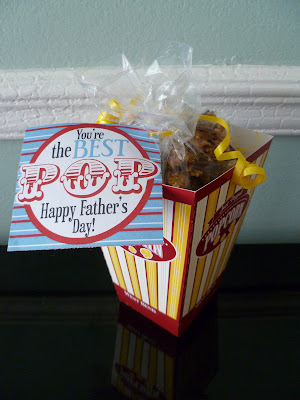 Pour the chocolate into the popcorn bowl and stir it really well. 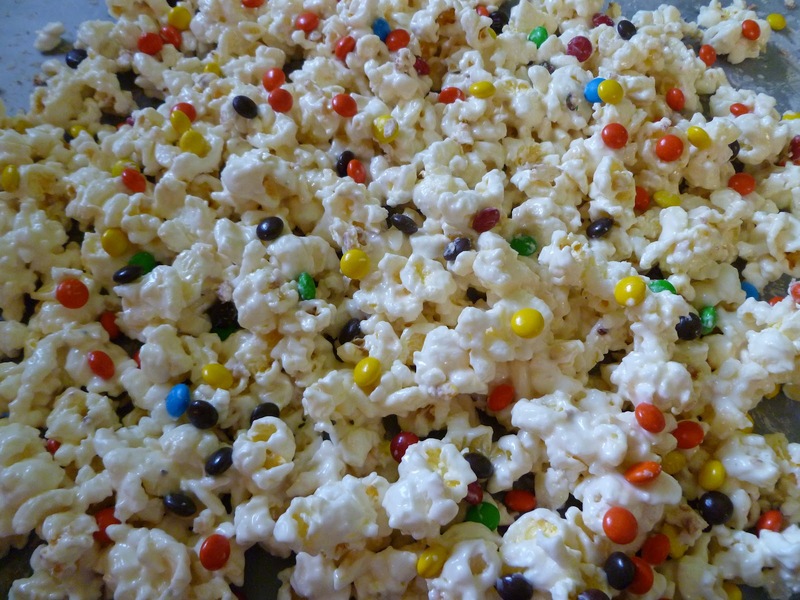 Then pour the popcorn onto a baking sheet lined with wax paper. Pour M&M's or Reese's onto the top before it sets up. Thanks girls for all your help. Happy Father's Day!